Licences 2016 - What’s New? We are constantly looking for ways to cater for your needs better. 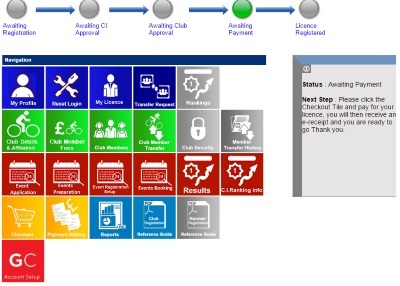 This year we have introduced a lot of new options, like the Cycling Supporter Licence and an anniversary renewal. We have also introduced a perpetual member option for leisure members, whereby when you are renewing your licence you can opt for a five year renewal, which not only offers a discount, but means you don’t have to worry about renewing your licence for the next five years. To avail of this option, when you are renewing your licence click on the link that says “Pay with GO CARDLESS” as below. Are you a cycling coach and what to learn some new skills? Maybe you are a rider who wants to expand your own knowledge of the sport? If so you should check out the #fosterthefuture coaching conference. Cycling Ireland has teamed up with Triathlon Ireland and Swim Ireland this year to offer you an opportunity to attend “Foster the Future” Coaching Conference, which will be held in UCD on Saturday 27th February. The focus of the conference is how to best coach juniors, and experts will be speaking on a host of different topics from nutrition to mental health. Read HERE for more information. This weekend the Junior Team for 2016 will be launched Dublin. With a large pool of talented riders to choose from, this will be an exciting year for the team. Keep an eye on the CYCLING IRELAND WEBSITE for the team announcement. Over the past number of months we have been sharing cycling tips and a series on bullying with our members through our FACEBOOK PAGE. To keep up with this check out the “Safe Tips for Cycling Trips” every Tuesday afternoon, and the Tackling Bullying Piece on Fridays. Every Cycling Ireland member has a profile in our online system. You can access this account HERE.When you log in you will see your account, like below, click on “my licence” and follow the steps.